Once upon a time, Bollywood thrived on an angry young man. That man had a suave persona, fiery eyes, a resounding baritone and incessant ringing box-office registers to cash. Since then everyone wanted to bake their cake and eat it too, there were similar inspired roles and characters and underworld became that genre writer’s favorite ‘u’ word. 2010 saw a high on drama, wafting of masala that would make you sneeze, homage to the gritty world of gangsters – Milan Luthria’s Once Upon a Time in Mumbaai. While was far from a good film by a mile, was in what the director’s camp hinges on – entertaining. 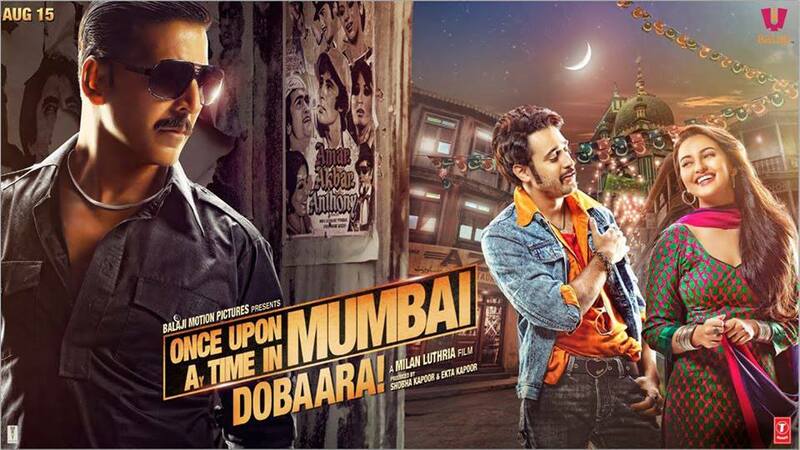 By laws of Bollywood, the director decided to bank in on the success and release a sequel which hit the theatres this week – Once Upon A Time in Mumbai Dobaara (OUATIMD). As the past has shown with sequels not living up to the fame of its part 1, will history repeat? Read on. Milan Luthria’s second innings in the franchise takes off from where the hit 2010 movie left – Shoaib (Akshay Kumar) takes to power after he backstabs his mentor Sultan. The police are after him we are told. He walks into a police station to prove he doesn’t fear the law, does a Tees Maar Khan on them, realizes it’s the wrong film, walks out immediately and puts on his don face, sunglasses, shadows, scorn et al. He rules the erstwhile Bambaai, with a gang of exactly four trusted loyals, his protégé Aslam (Imran Khan) being one of them, returns to the city planning to take out his rival Rawal (Mahesh Manjrekar). Starlet Jasmin (Sonakshi Sinha) catches the fancy of Shoaib. She asks his name, he recites a rhyme ‘Naam bataya toh pehchan bura maan jayegi…’ he drawls. The literacy-challenged girl gets bamboozled with the word-play and we have a curious case of misunderstandings which takes 160 minutes to unroll. Akshay Kumar isn’t at his finest; you’ve seen him do better in his Khiladi or comedy roles. No fault of his though, he genuinely tries but his character is poorly written, the script around the character maybe not written at all. The transition from a gangster, who announces ‘Villain hoon main!’ to the audience every far and few seconds, to an obsessed lover isn’t clean, his grim demeanor maintaining a horizontal plane thru and thru. He doesn’t carry forward Shoaib’s cockiness or harbor the raw intensity of Sultan. Imran Khan has a ‘what am I doing here’ question stamped on his forehead from the word action. How and why was he cast for this role; could possibly make an interesting case study. He channels his inner ‘fattu’ from his debut movie, not displaying a glimpse of daredevilry for a gangster nor gets time to play his trump romance cards. Sonakshi deserves props for maintaining her own, despite a daft narrative and role, she packs in punch, keeps it real. Watch out for a stunning Sonali Bendre who brings a refreshing respite by a mere 30-second presence. Cinematographer Ayananka Bose isn’t able to repeat the camera magic and how can he possibly, when the muse has been substituted from the queen’s necklace in the first film to Sonakshi’s cleavage shots in this one. The production values that were the USP of the predecessor had me a tad bit confused here. If that one was based in the 70s and this one has a 20-year jump, wouldn’t the sets be designed to reflect the 90s accordingly? Or were they basing it on the 80s? There is a famous adage that what isn’t broken needn’t be fixed. While the premise borrows substance to keep this sequel afloat, the issue is that there isn’t enough cohesiveness in the conflict between the king and his sidekick. There is very little carried forward from part 1 bearing a few references and one-liners which end up being this film’s best moments, the rest of it could altogether be a different movie. The Mafiosi indulging in shaayari’s and nursing heartbreaks over scotch, fake props and faker makeups make it all gloss and sham. The pauses, close-ups, screechy background score, shrill of a telephone ring cutting the suspense; this is resemblance to a Balaji tele serial that has been transported on 70mm. With emphasis on keeping it stylish, the film loses its edge thru random scenes, rationale challenged sequences and a falling climax. Two guys like the same girl, this love triangle has some botched up discourse on love, birds & bees and dhokha that keep going in circles with no one in any hurry to get anywhere in particular. World is round indeed. With a title to leech on and some references thrown in to jog audience’s memory, OUATIMD does not make a worthy successor.